God I am loving the local birding at the moment, there is expectation and mostly interest every single day. Today was the turn of Bullfinch to find its way onto my patch year list, a species I think I missed last year. There have been a number of indications that this enigmatic species was coming in as part of the same invasion of Hawfinches we are currently seeing, and Nick and Bob's records from the area around Long Wood had sounded very encouraging in terms of birds sticking around. I failed in an hour-long trudge at the weekend, but this morning birds were far more vocal and I heard that soft piping and got a glimpse of a male in some dense foliage. I put the news out and at that very moment Bob came around the corner, so I silently motioned where it was. He skirted around the other side and came face to face with it. but it had disappeared by the time I joined him. Nevermind! Hopefully it sticks and James can get it/them (as there may be a pair) at the weekend - he needs it for a long-awaited patch tick and I bet he is chomping at the bit! Other than this success, which sees me hit 110 and is thus my fifth highest patch total since I started, it was relatively sedate. No large numbers of Wood Pigeons, no huge thrush totals. Instead I was content with a couple of Redpoll and a flock of seven Brambling. I like Brambling - not only are they good looking, but they also make a unique sound when they fly over. As I mentioned the other day, flyover finches that make no sound as they zip through are hugely annoying. Even some that do make sounds can be annoying, but Bramblings leave you in no doubt, and for that they should be commended. I am aware that I have not posted a recent photo for an age. This is because viz-mig does not lend itself to the kind of photography I enjoy, and when I do not enjoy something it generally does not feature. Work is the exception to this rule. So rather than blurry underexposed shots of what I am calling a Hawfinch, you get nothing at all. It is for the best, trust me. I would love to be able to document my mornings out on the Flats in a suitable manner, but I just cannot get excited by record shots. Here, what about my breakfast? This is the vizmig fuel taken on before setting out each morning. 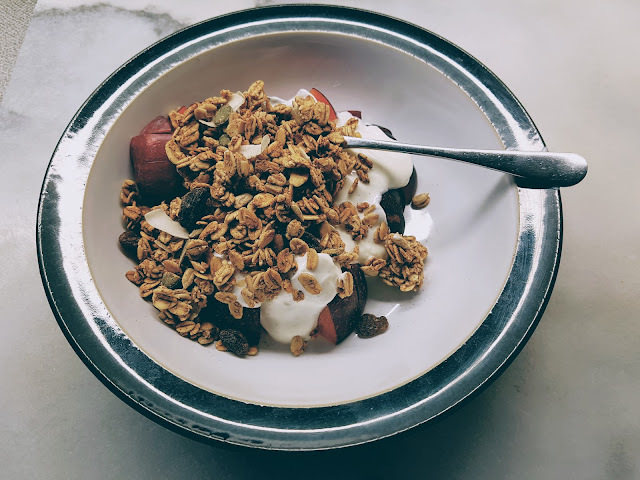 This was plum I believe, with yoghurt and granola, and is now my go-to morning sustenance. I blame my recent trip to California for this conversion, previously (and it shows) I was all about the bacon sarnie. These are now reserved only for Fridays when I get to the office. All other days and it is this. If you have yet to see a Hawfinch, it could make all the difference.